Well, it’s been an interesting couple days. I’ve had a series of ups and downs at work lately. I teach French at a high school in Milwaukee, and since I am the only French teacher, I have every level so I see a large variety of students. Yesterday, school started off badly with several students giving me all sorts of lame excuses as to why they did not have their projects that were due (my computer wasn’t working, I had papers for other classes, etc.) Give me a break! I was in such a horrible mood by lunch that I was really dreading my last 2 classes… until my French 2 class performed their skits. I like to have the students do skits sometimes in lieu of a unit test so that they can show me they know how to use the grammar and vocabulary in conversation, so the French 2’s created group skits with the requirements that I provided them. Oh. My. Gosh. They went way above and beyond the call of duty for these. They were so creative and not to mention freaking hilarious. One involved kidnapping and interrogating Gilbert Gottfried (one of my students does a really accurate impression of him! ), another was an Oprah interview, and I had one male student who pretended to be Miley Cyrus and entered the room on a stability ball (or as one student called it: the weird ball with udders) and there may or may not have been some twerking upside down on the wall involved. It was a little disturbing, but nevertheless I laughed hysterically. When I got home from work, I was in the mood for something homemade, but quick. I decided on my go-to quick dinner: Chicken Pad Thai. If you haven’t made it before, I recommend it. It’s quite tasty and very easy to make. I apologize for the picture by the way… I was so hungry that scarfing it down immediately was more important at the time than presentation. Recipe adapted from Thai Cooking & More, by Publications International, Ltd.
*The original recipe calls for bean sprouts, cilantro, and peanuts, but I prefer the Pad Thai without these. While the noodles are soaking, combine the rice wine vinegar, fish sauce, lemon juice, ketchup, sugar, and red pepper flakes in a small bowl. When the noodles are done soaking, heat oil (I used sesame oil but vegetable oil is just fine) in a wok or large nonstick skillet over medium-high heat. Add chicken, green onions, and garlic. Cook until chicken is no longer pink, stirring constantly as not to burn the garlic. Stir in the noodles, cook about 3 minutes (you may need to add a tad more oil here) Stir in the sauce mixture and toss to coat evenly. Cook until heated through, about 2 minutes. Serve with the shredded red cabbage, shredded carrot, and you can add chopped cilantro, peanuts, and lime garnish if you’d like. I love this recipe because I am a Thai food ADDICT, so I am thrilled when I can successfully recreate my favorite dishes at home (still looking for a good recipe for Thai Red Curry if anyone knows of one – my last attempt was an epic failure!). It’s also incredibly versatile – you can add whatever you’d like to it – shrimp, lime, onions, etc. I can’t stress enough how easy it is. The longest part of making this Pad Thai dish is soaking the noodles, and while those babies soak you can mix up the sauce and get everything chopped up and ready to go. I definitely recommend it! 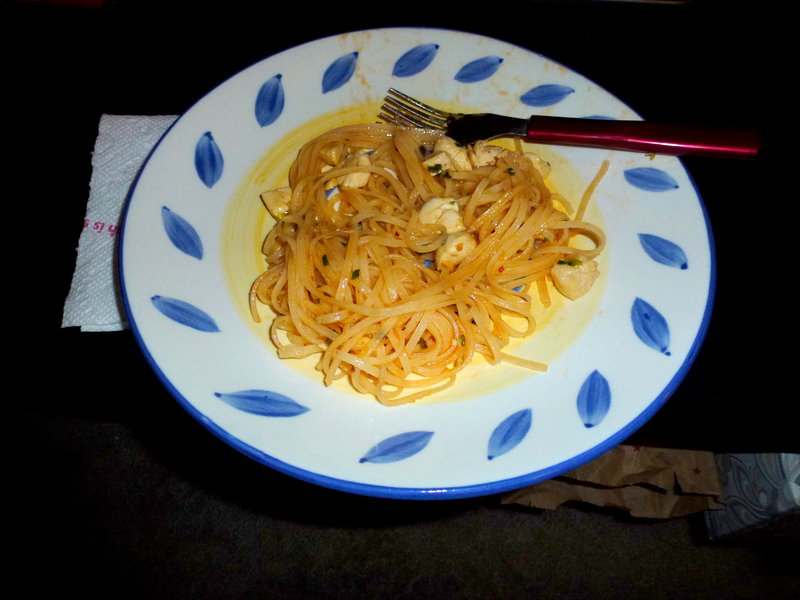 This entry was posted in Asian Inspired Food and tagged chicken, easy, noodles, Pad Thai, recipe, Thai. Bookmark the permalink.